I was totally going to write something about my husband doing something eyeroll-worthy, but dammit, he never does anything wrong. I could write about his single flaw, the over-use of Glad Wrap (oh my god, the leftovers were trapped!) But he's seen the error of his ways and stopped that. Now he uses waaaay too little (oh my god! Gross little hard bits on the cheese!). Literary goldmine. Let me instead weave you a tale of mild horror that happened when I first started at a job I had a few years ago. I was the on the lowest rung of a notoriously hierarchical industry, and therefore invisible. It was a tough nut to crack, and I was above nobody but the work experience kid. Had this been 1962, I'd be fetching the coffee. After I'd been there a few weeks, and spoken to directly probably twice, I was invited to a night out. It was funny - in our jobs we spoke to people all day long, but rarely spoke to each other at work. Nights out were a different story - hell, there was even singing. Let's see the work experience kid get invited to this! A few hours and a few new friends later, I looked around. My inviter, the only person out of this bunch to have spoken to me during sober daylight hours (even if it was to tell me I had once gotten my its and it's mixed up) had abandoned me. I had been told to expect black-belt drinking and it was assumed that I shouldn't try to keep up. Where I come from, we stick to the code. If we're out drinking and you fall behind, you get left behind. I just made my way to the second location to continue the party. NBD. This was my mistake. Ever see that episode of Oprah where she talks about people being abducted, and the advice is if you're ever abducted, you never let them take you to the second location? That's where you'll be killed. Bad things happen at the second location. It stops being fun and you realise you're hungry and you have to work the next day and the party has totally died. I made myself comfy on a recliner and watched in semi-awe and semi-amusement at the exuberant small-unit-loungeroom-dancing. I was sober, tired, and more than a little weirded out at seeing my esteemed work colleagues in such a state. That's when my inviter decided to climb on my lap, announce "I love you" and go in for a pash. Before I knew it, her extra weight on the flimsy extended part of the recliner caused the whole thing to tip over and she went flying backwards into the coffee table. I jumped up in horror - she did what?! I almost did that thing that kids do, sticking out my tongue and frantically rubbing all the girls germs off it with both hands. Now what's wrong with a little girl-on-girl action you ask? Well, nothing. Except I was married. And sober. And just not that into her. Monday morning rolled around and I went back to being ignored and she went back to sending emails to everybody telling them their grammatical faults. Never let them take you to a second location. It's good advice, children. 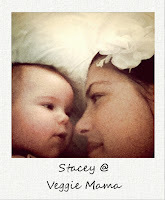 Stacey is The Veggie Mama and if you haven't checked out her blog yet you are missing some serious scrummy food. She's also made a recent foray in to the non food blogging world at The Ramblings of a Madman. She's a journalist, a wife, a teacher, a vegetarian, political tragic, hip mama, hippie food fearer, travel junkie, and a lover of all things gorgeous including the ever adorable Veggie Baby. Make sure to join the rest of her minions (like me) by following her on Twitter and Facebook. It's just as painful re-reading it! I had a headache this morning until reading this. Laughed so much it's almost gone. You're a genius, even if you do make grammatical mistakes! Will remember second location advice for DPCON12. At least it was a woman. Imagine if it were some nerdy little man who then thought you were into him? Ew. There are just some things that one should never to with/to a co-worker . . . jumping on their lap, telling them you love them and trying to kiss them . . . that is right at the top of the list! I still can't understand why she thought I would ever be into her! It's definitely at the top of mine... i see it's not a priority for her, haha!